A Safety Pin and a Grocery List of Health | Doppsonline.com Dopps Chiropractic: Our family bringing health to your family for over 40 years! Picture a safety pin. Yes, like an old fashioned diaper pin, or the save-me-I-don’t-sew pin you used in college. A closed safety pin is a simple analogy of how your nerves carry messages from your brain to your body and back in a loop from your body to your brain. The body in this state of alignment is functioning with ease, with messages cycling around the body. An open safety pin demonstrates the disrupted loop, with the connection broken and messages unable to efficiently cycle from brain to body or body to brain. This misalignment causes abnormal, malfunction and dis-ease. 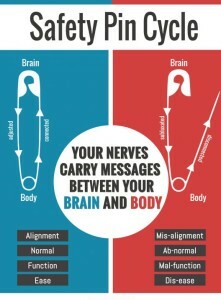 The principle of chiropractic is to close that pin, bringing the nervous system back into efficient connection with the brain. When this is achieved, the body is able to function and innately heal itself. Beth, a patient at Dopps Chiropractic NE, is an example of the wide range of benefits of continuing chiropractic. In her thirties, Beth has been coming to Dr. Ryan 2 per week for 2 months. She recently gave him a list of how her health has improved since being regularly adjusted. Beth has lost ten pounds and says she is sleeping more comfortably and no longer wakes up with difficulty breathing. Her children can now sit on her lap without pain shooting down her thighs. Her sciatic and ankle pain have been eliminated. With her improved sleep and lack of pain, Beth doesn’t need caffeine. Her grocery list of health continues—she is off of birth control without constant heavy bleeding, and has elected to take herself off of other medications as well. If you are interested in restoring your body’s connections and improving your health, call Dopps Chiropractic NE for an appointment with Dr. Ryan or Dr. Denise Dopps.